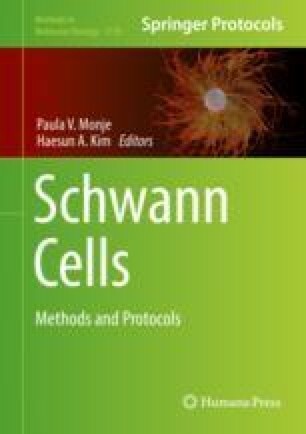 The most widely used method (Brockes’ method) for preparing primary Schwann cell culture uses neonatal rat sciatic nerves as the primary source of Schwann cells. The procedure is relatively simple and yields a highly purified population of Schwann cells in a short period of time. The method has also been used to prepare Schwann cells from mice, however, with limitation. For example, Brockes’ method is not applicable when the genotypes of mouse neonates are unknown or if the mouse mutants do not develop to term. We described a method ideal for preparing Schwann cells in a transgenic/knockout mouse study. The method uses embryonic dorsal root ganglia as the primary source of Schwann cells and allows preparing separate, highly purified Schwann cell cultures from individual mouse embryos in less than 2 weeks.